Located in the heart of the city of Amritsar, the 40.5 square feet Golden Temple stands on a 67 square feet platform amid a square tank. There is a bridge leading to the Golden Temple. The shrine is representative of the tenets of Sikhism. It also stands for the valor and vigor of the Sikhs. 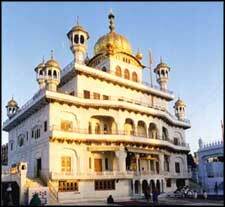 With doorways on all four sides, it symbolizes the tolerance of Sikhism – greeting all four religions with open arms. The bridge that connects to the temple is linked with the 13 feet broad ‘Pardakshna’ (circumambulatory path). It actually runs round the main temple and it reaches the ‘Har ki Paure’ (steps of God). On the first storey of ‘Har ki Paure’, you can find a continuous reading of Guru Granth Sahib. The main shrine of Sri Harmandir Sahib is a three-storied one. The facade, which faces the bridge, is adorned with continuous cusped arches and the roof of the first floor reaches a height of 26 feet and 9 inches. Atop the first floor a four feet high parapet surrounds on all the borders which has also four ‘Mamtees’ on the four sides and precisely on the pinnacle of the central hall of the main sanctuary mounts the third storey which is a small square room with three gates. On the top of this room is the low fluted ‘Gumbaz’(dome) with lotus petal pattern at the base of an inverted lotus which actually supports the ‘Kalash’ with a strikingly decorative ‘Chhatri’ (umbrella) at the end.